ITH SWEAT on my brow, I began the final piece on my jury program: a Concerto by Ludwig Van Beethoven. Approaching the recapitulation, I saw one judge raise a hand, saying simply: “Enough.” I stopped playing and knew my career was over. Pretty dramatic, huh? And every word is true … but there’s one problem: it’s false. But if it’s false, how can every word be true? The author (in this case, myself) is guilty of sensationalism. For example, it’s true they stopped me before the Recap … but they always stop students before the Recap. (In a Classical Concerto, the Recap is the same basic music, transposed to a different key.) It’s true my “career” was over, but that’s because I’d made a decision to switch majors, so this was my last piano jury. And, yes, I was sweating like crazy, mainly because (Uh oh!) I hadn’t memorized the Recap of the Beethoven, since the judges normally stop you before the Recap. Still, just knowing they might ask for the Recap made me nervous. If they did, I was in big trouble. SENSATIONALISM IS THE SCOURGE of our age. Just look at the reporting on Pope Francis, which has been inaccurate to the point of absurdity. The unqualified journalists who try to “make sense” of what’s happening are totally clueless about even the most basic facts. I’ve been taking a lot of screenshots of the nonsense so I’ll have a record of it forever. I recently came across an article where Damian Thompson relates an event the same way the piccoluomini might. That is, his account is silly and uninformed to the point of absurdity. A famous concert pianist, Stephen Hough, tears apart the account here. Hough does a good job, so I won’t repeat everything he says. 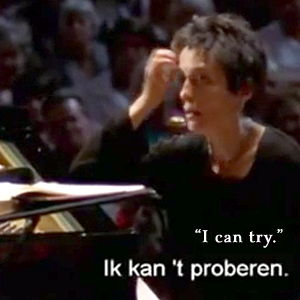 To make a long story short, it’s bizarre that both conductor and pianist were too lazy to discuss things like tempi beforehand, and it was not a “miracle” that Maria João Pires could play a piece she’d performed every year for the past eight years. SPEAKING OF SENSATIONALISTIC NONSENSE, the other day I mentioned The Monk’s Tale, which is a biography of Godfrey Diekmann. Perhaps I shouldn’t call it a biography; it’s more of a “hagiography.” Even though it’s written by a Catholic sister, I couldn’t find anything in the book which condemns or criticizes Diekmann’s troubling beliefs, such as his support for women’s ordination to the priesthood or his fanatical promotion of the “hootenanny Mass.” Reading The Monk’s Tale, one also gets the impression that the 1970s ICEL translation (with which Diekmann was quite involved) was the greatest, most wonderful thing of all time. However, folks like Godfrey Diekmann never anticipated the internet, which allows honest Catholics to see for themselves the truth. After all, in the 1970s, the official Latin texts were incredibly expensive and hard to come by, so many Catholics had no idea how inaccurate that first translation was.